CHICAGO—After announcing the latest Taxpayer Traitor David Harris, taxpayers will visit his district to inform the voting public of his treachery. David Harris is among 11 Republicans to have sided with Chicago machine Democrats to pass a 32% state income tax hike. This $5 Billion tax increase will be used to pay for the bloated government pensions. According to James Tobin, “The State must cut these lavish pensions or default on the unsustainable, overly generous handouts”. In order to fight rising state income taxes and ballooning pensions TUA is identifying the Republican Tax Traitors who helped pass the state income tax increase. 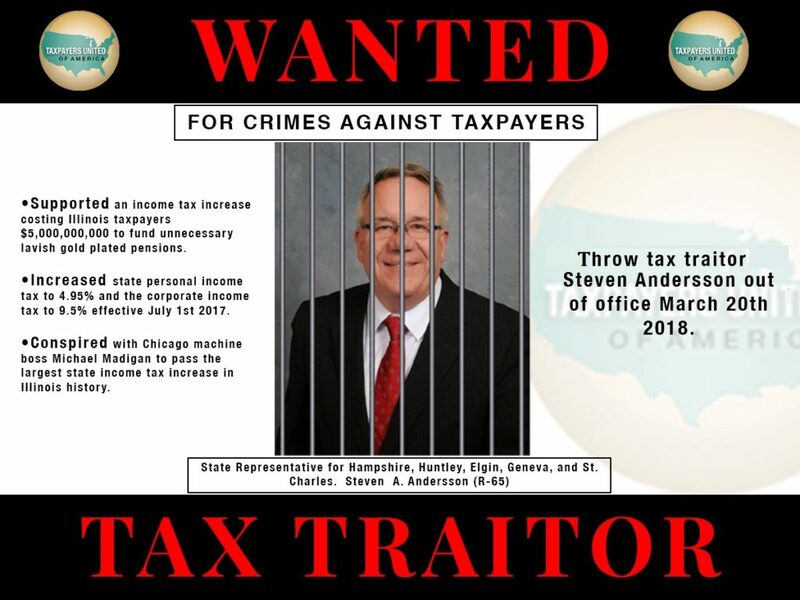 The first Tax Traitor, Steve Andersson, has already been forced to no longer seek another term in office. TUA representatives will soon visit Mt. Prospect and Prospect Heights, which are in David Harris’s district, and inform voters of his betrayal. 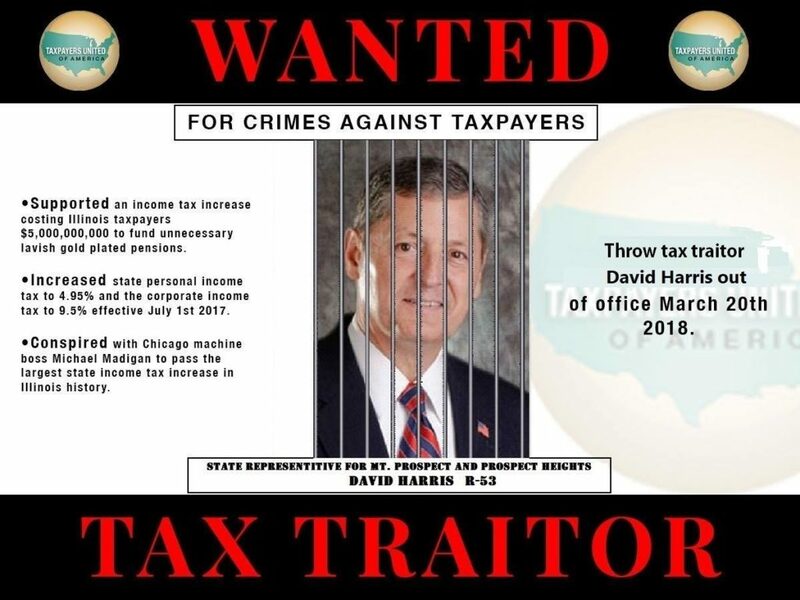 TUA will be distributing wanted fliers of Tax Traitor David Harris. The press conference was held after a TUA victory in Illinois House district 65. TUA helped oust Representative Steven A. Andersson from his current district. Representative Andersson was the last tax traitor to be named, and TUA takes rightful credit for ending his run as state representative. “(Steven A. Andersson) is gone, that’s one down, and eight to go,” said Jim Tobin, TUA President. Now TUA turns its attention to David Harris of district 53. 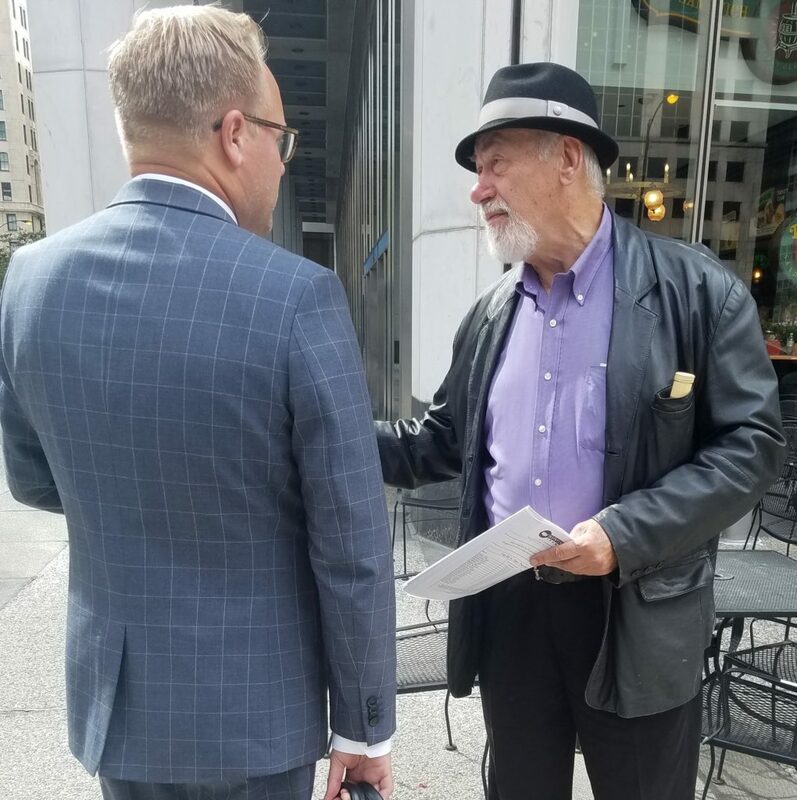 David Harris was one of the Tax Traitors that sided with Michael Madigan, raising the personal income tax rate by 32% this last July. Shifting pressure onto David Harris, TUA will be utilizing new tactics that were deployed against Rep. Steven Andersson, and will increasing the intensity of their efforts. “It’s a shame that these Republicans have betrayed their constituents, and Mr. Harris needs to be thrown out of office,” later stated Jim Tobin. These Taxpayer Traitors have betrayed their constituents and must pay the price. TUA will continue to expose these Republican turncoats until all are gone. It’s time for a massive housecleaning in Springfield! View Daily Herald News article featuring TUA! Tax Traitor Steven Anderson (R-65), a key vote in passing the 32% personal income tax increase in Illinois, will not be running for reelection. This comes after being lambasted by our president Jim Tobin and listed a traitor by our organization in Champaign IL. on July 9th 2017 at Bob Redfern’s Illinois Forum. 1 down, 8 more to go! President of Taxpayers United of America James Tobin addresses the 5 billion dollar Illinois State Income Tax increase for lavish gold-plated pensions!